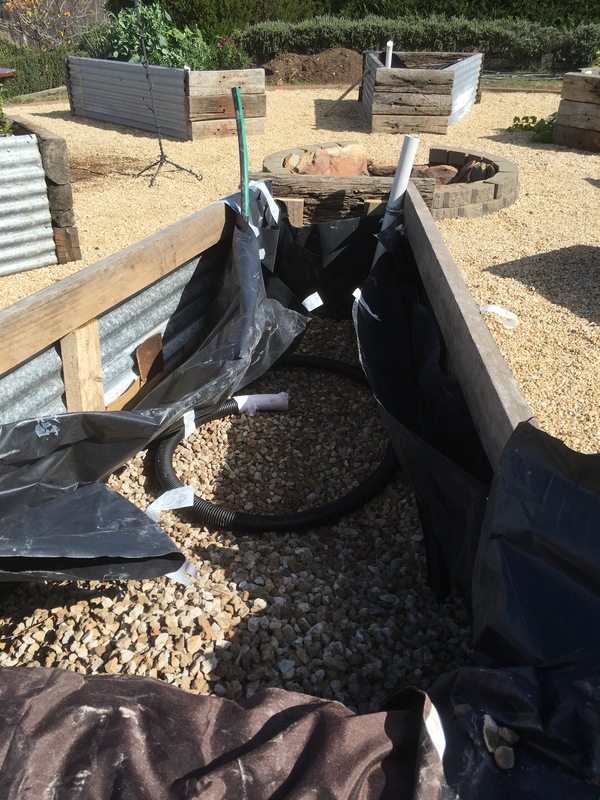 In my previous post, we constructed the base of some self watering wicking garden beds (you can read all about it here). 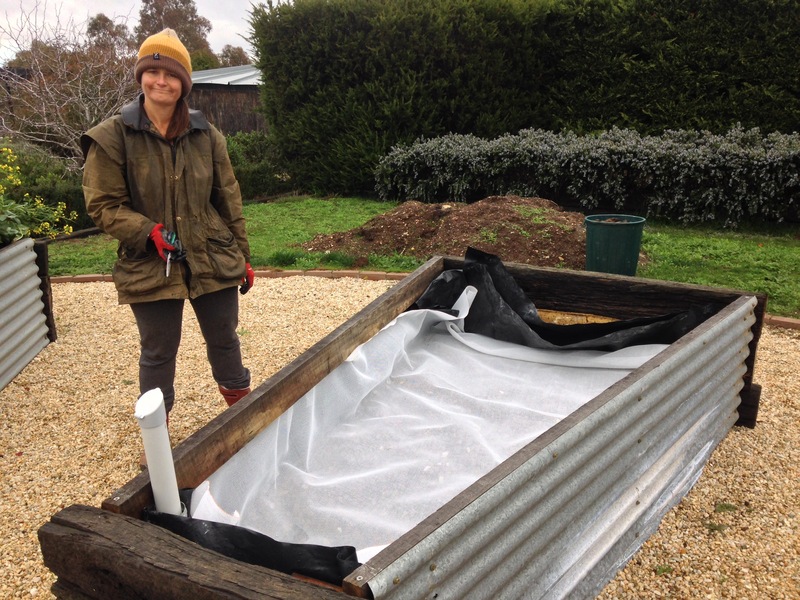 We made our wicking beds out of old railway sleepers, recycled corrugated iron and other timber we had lying around. 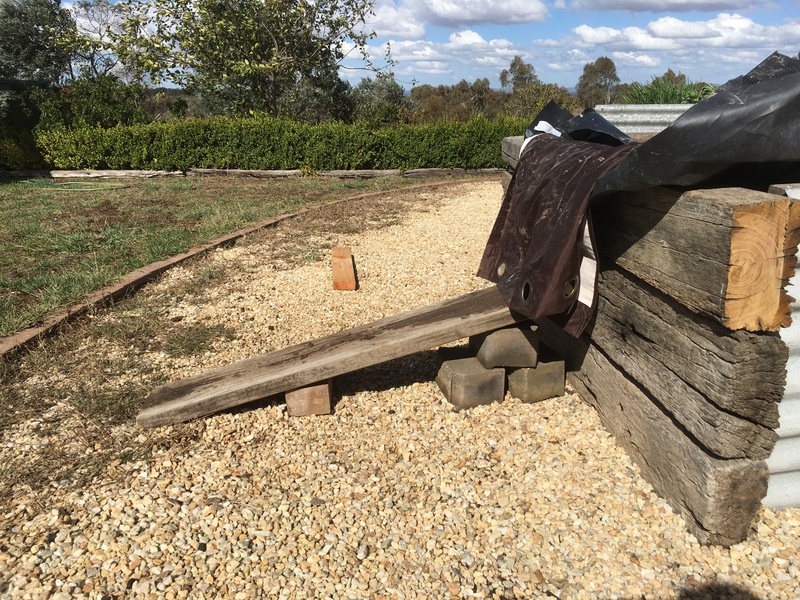 You can make wicking beds out of anything suitable for holding the weight of the gravel and water you plan on putting in them. The next step is to line the beds with some cardboard or old carpet underlay to protect the water proofing plastic liner. If you have some old carpet underlay, you can use it to line the beds. Most underlay provides a good base that is resistant to rotting quickly. It doesn’t have to be pretty – just cover the base. The next step is to line the base with a waterproof membrane. 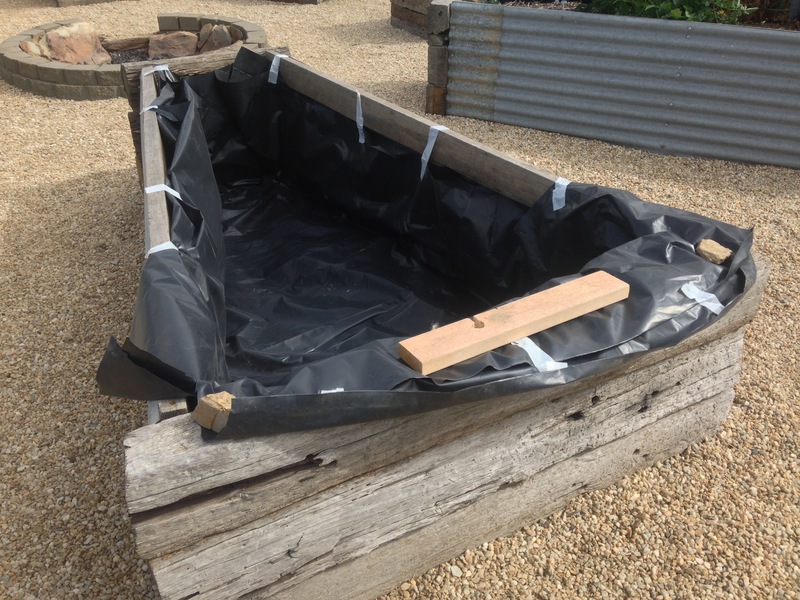 We initially priced pond plastic, but it is incredibly expensive. 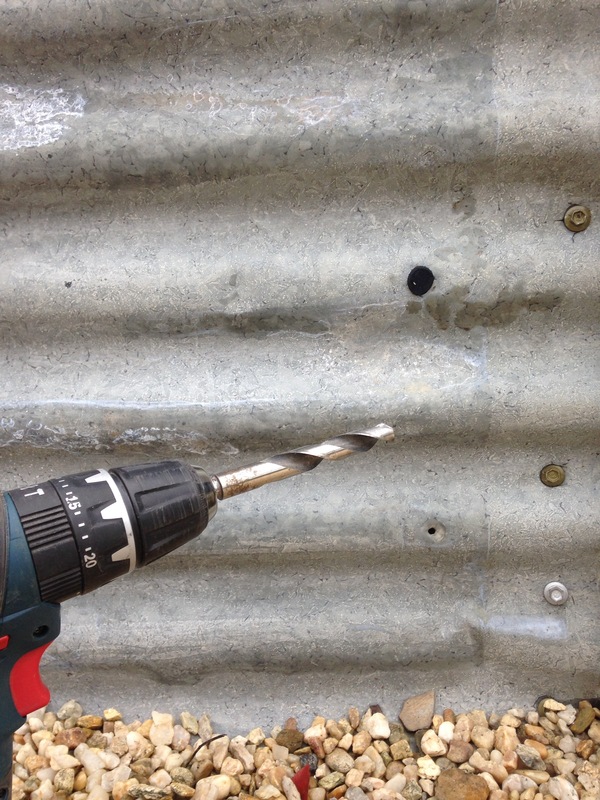 A suitable alternative is builder’s plastic. We bought a large roll, which we doubled over to give two layers. The tape holds the plastic in place while we fill it. Now comes the fun part. Time to fill the beds with gravel. We constructed a ramp to make it easier to run the wheelbarrow up and tip gravel into the beds. This is done in stages. 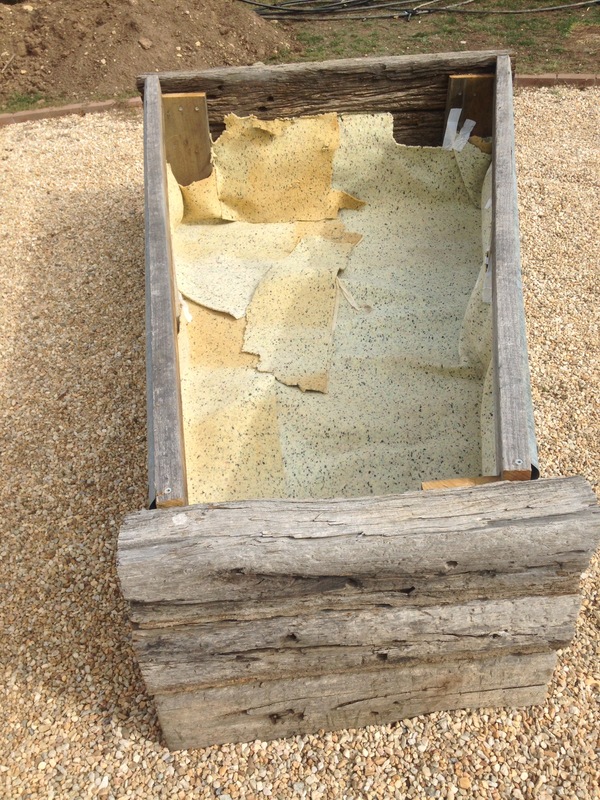 Firstly a 100mm layer of gravel is put into the base of the beds. 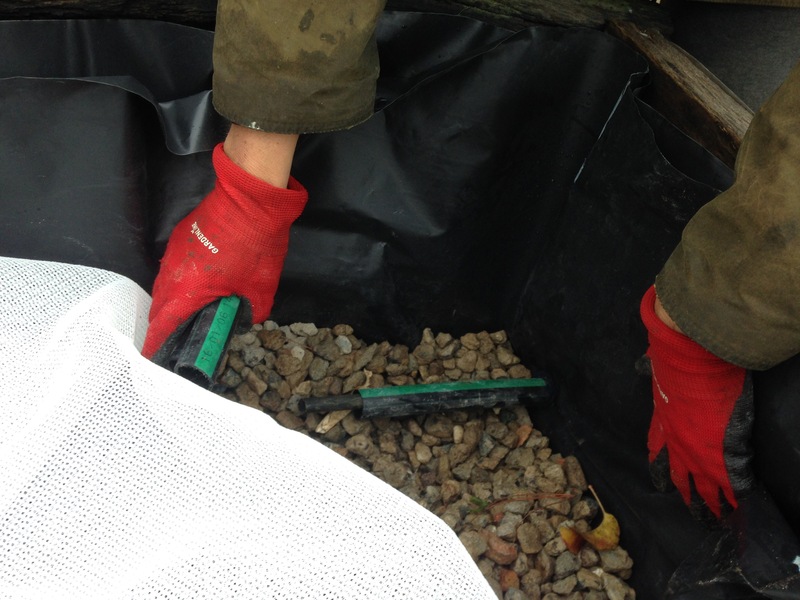 We used 20mm recycled concrete for our gravel bed, mainly because it was extremely cheap. After you have a 100mm gravel base, it is time to put in the irrigation pipe. We used standard 50mm PVC pipe and brackets for the filler tube or riser. To distribute the water quickly and evenly through the bed, some 50mm Agricultural Pipe (ag pipe or drainage pipe) was curled around the bed. The PVC fittings were glued, using PVC glue, however the ag pipe was simply taped to the PVC pipe using cloth tape. The Ag Pipe is laid on a 100mm bed of gravel. Once the filler pipe and ag pipe is in position, the hard work begins. If you’re able to hire a strapping young lad for this part of the process, then that makes life a lot easier. 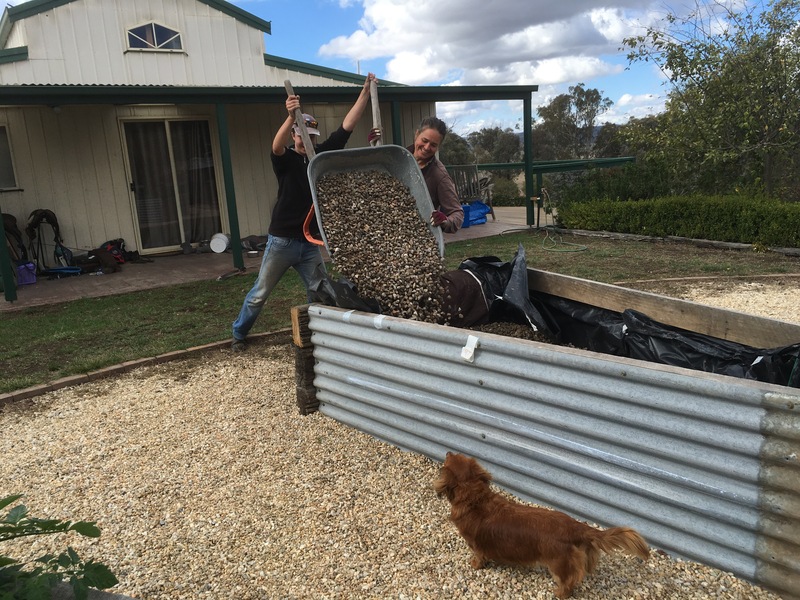 We enlisted the help of a friend’s 15 year old and in a few hours of intense labour, managed to fill three of the new beds with gravel to the required depth. 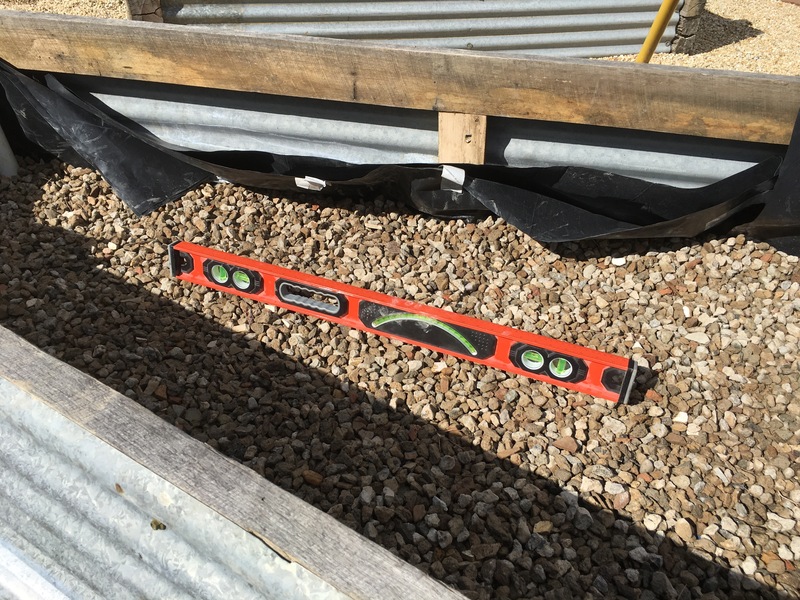 With the gravel filled to the required depth, it is a good idea to check for level. You can do this with a fancy sirit level, or by filling the beds with water. The next step is to put a drain in the beds. We used a 12mm irrigation pipe, protected by a 19mm pipe. Some old pantyhose over the end stops mosquitoes from breeding in the beds. Once you have the drain installed it is time to put some weed mat or shade cloth over the gravel. 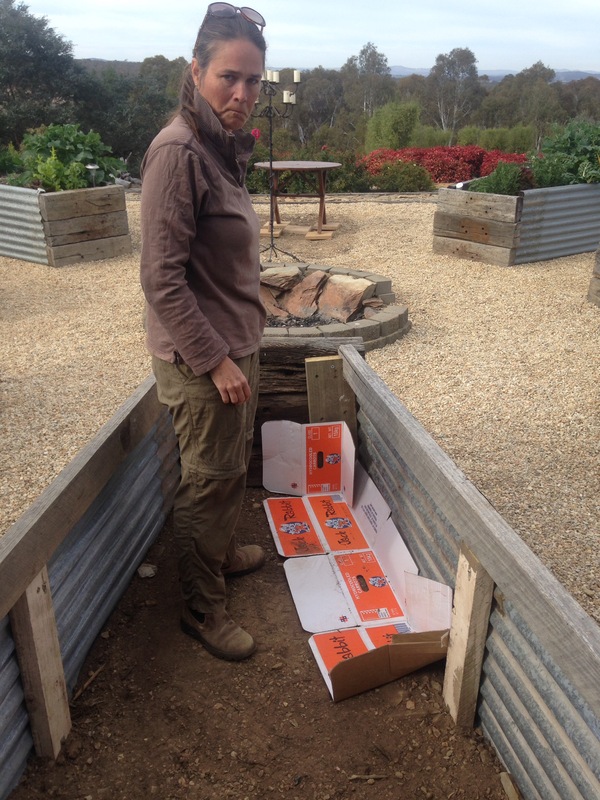 This helps keep the soil on the top from disappearing into the gravel. It also allows the moisture to wick into the soil. Finally it is now time to fill the top third of the beds with soil. Again it is handy to hire a strapping young assistant for this process, but if you don’t have one to hand, I’d suggest gently asking the person who desired the beds to be built to lend a hand..
Do not offer advice during this phase of the construction – or you might find yourself wearing some of the wonderful compost! 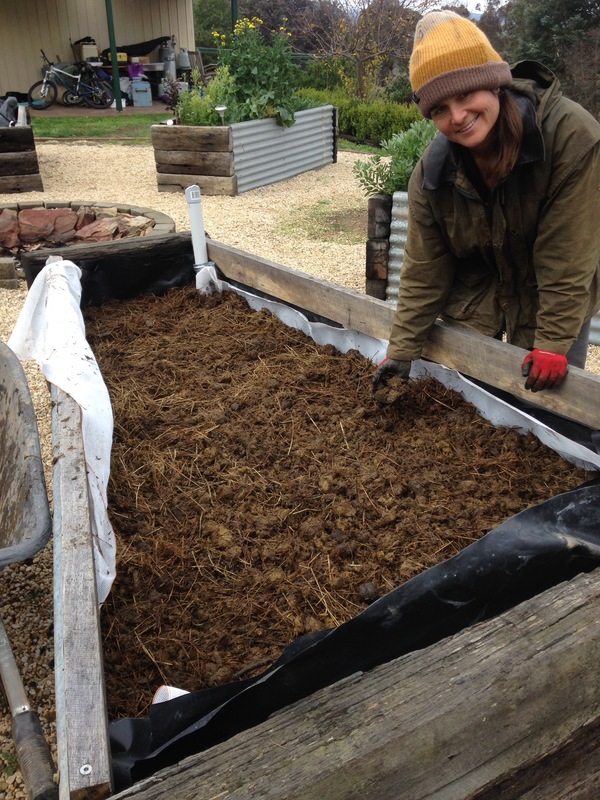 We were fortunate to source some of the most expensive compost in the world for our garden beds. You buy good quality horse food, and process it through the said horse. Then you mix it with fine quality straw, that is used for a short period as a soft bed, before the horse wees and tramples it into the mud. This product is then turned and mushed for a few days before you rake it and apply it to your garden beds. And you’re done. 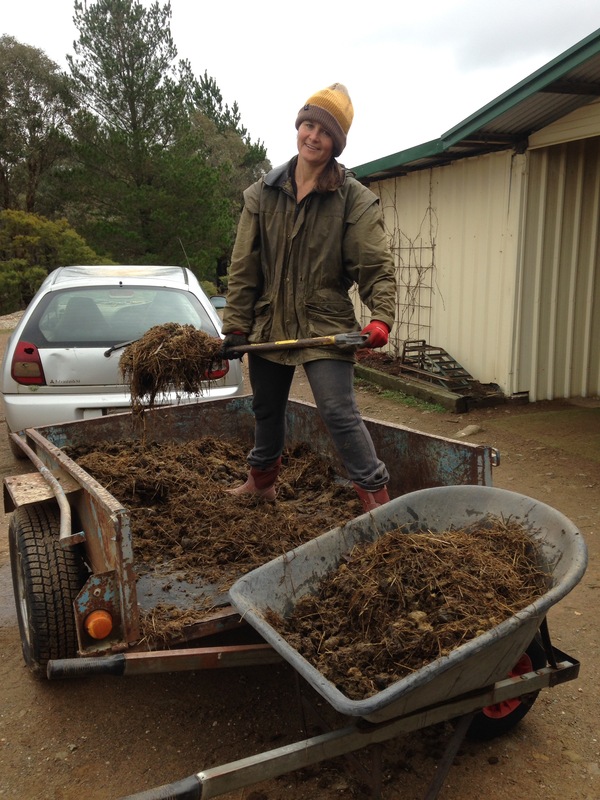 If you’re like us, it will be just in time for winter – a particularly difficult time to grow anything on the Rock Farm. I guess it doesn’t matter when you finish your project… it is just important that one day you do finish… even if it is 18 months after you started!! !